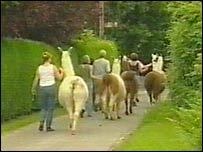 Llamas and alpacas may soon become a familiar sight trotting through the Kent and Sussex countryside. 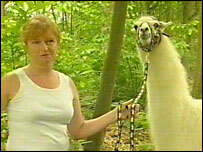 Mrs O'Donnell, 48, of Blue Caps Farm, Cousley Wood, East Sussex, said she fell in love with the creatures after visiting Ashdown Llama Farm four years ago. Since then, she has built up her own herd of 22 llamas and 20 alpacas - more usually seen in the Andes mountains of South America. "I thought they were very, very attractive animals," she said. "They bond with you like pets do - they're very friendly and inquisitive. "They're not touchy-feely type animals like a horse but with a bridle on they are very biddable." Mrs O'Donnell, whose farm sits on the boundary between Kent and Sussex, believes the trend for llama-trekking - already big in the US - could take off in the area. And she wants to give both children and adults the chance to take the animals on short and longer walks. She said: "You can walk for five miles and take a picnic carried by a llama - it's nice to see the countryside without having to carry anything. "We take them out all the time. We've been training them over the past year and taking them to shows as well. "There's so many things you can do with them." Mrs O'Donnell hopes eventually to sell some of the animals as pets, as well as using their wool for textiles.